EP-510HC Hydraulic Compression Tools: Izumi Products. 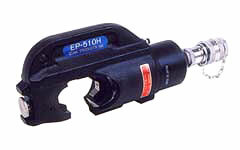 The EP-510HC is a remote C-head that requires an external 700 bar or 10,000 PSI pumping source. 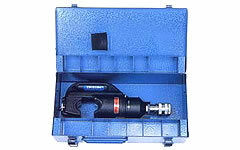 It accepts all U type dies used with conventional 12 ton compression tools. The larger jaw opening of 42mm accepts conductors and mid-span sleeve connections up to 750KCM. Consult your manufacturer for exact cable, connector and die combinations. When ordering dies, specify the manufaturers die and connector numbers.